The primary customers for the Sukhoi Superjet aircraft are the Russian airlines Aeroflot, UTair and Gazpromavia, and Mexico’s Interjet. 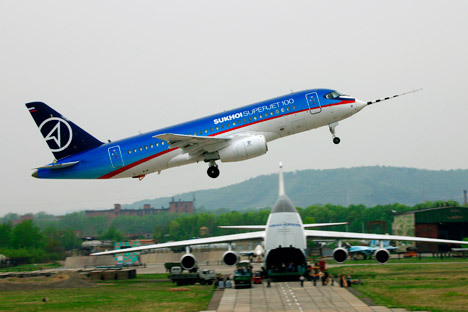 Russian aircraft manufacturer Sukhoi is planning to ramp up output of the Superjet 100(SSJ100) regional jetliner. In 2013, Russia built a total of 32 civil aircraft and this year's plan calls for building 46: 40 SSJ100s and six Antonov An-148s, according to Andrei Boginsky, director of the aviation industry department at the Ministry of Industry and Trade. “In 2015, we should be building 56 Superjets,” Boginsky said. The primary customers for the Superjet are the Russian airlines Aeroflot, UTair and Gazpromavia, and Mexico’s Interjet. Sukhoi has not disclosed the additional costs required to increase production, but has said that 76 percent would be covered by its own funds and commercial loans, while funding from the state budget will account for the remaining 24 percent. Sukhoi expects to receive orders from Aeroflot's new low-cost subsidiary Dobrolet, but only after Sukhoi has increased production to a level of 60-70 aircraft per year. Oleg Panteleyev, editor of the aviation industry analytical journal Avaiaport, said that Sukhoi is likely to continue to produce fewer than 50 airframes per year into at least late 2015, given its production capacity. If a major contract is landed with Dobrolet or another carrier, Sukhoi will have to apply for a loan in order to ramp up production. Otherwise, it may simply lose the new business, Panteleyev said. Gediminas Ziemelis, chairman of the board of Avia Solutions Groups, said that production issues aside, Sukhoi will only be able to secure a new major customer – particularly in the budget segment – if it can offer an appealing price. “Boeing and Airbus in their time offered nearly below-cost prices to Ryanair and easyJet, respectively, and made money from subsequent orders,” Ziemelis said. Sukhoi could reduce the SSJ100 unit price to $13-14 million from the current $25 million (excluding VAT) if it attracts a customer prepared to order at least 70 or 80 airliners. Such a volume would help the manufacturer strengthen its after-sales support, which currently is “significantly behind that of the Western manufacturers” in terms of support schemes and personnel qualifications, according to Ziemelis. Russia's other priority civil aviation program this year will be the Irkut MS-21 mainline passenger aircraft. Around 17 billion roubles ($480 million) is being allocated for the program from the federal budget in 2014 alone. Total investments will amount to some 164 billion roubles ($4.6 billion), including 50 percent from the federal budget, said Boginsky. Based on articles from RBC Daily and Rossiyskaya Gazeta.